During the last seven months we have seen three new merit badges introduced to the Boy Scout merit badge program (Scuba Diving, Geocaching, and Scouting Heritage). 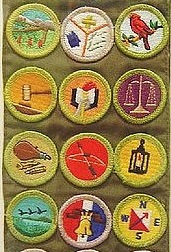 We have also seen the return of four merit badges for this year only (Signaling, Tracking, Pathfinding, and Carpentry). But did you know that the BSA is not done yet? Two more merit badges should be introduced this year, the Inventing and the Robotics merit badges. Yes, that is right, two merit badges for the tech savvy Boy Scout. These badges are being introduced because they received positive feedback in a youth interest survey. If five new merit badges seems like a lot, it is. By comparison, the BSA introduced just six new merit badges between 1992 (Collections) and 2006 (Composite Materials). But the new badges aren’t the only innovation. In the past it took three years to create a merit badge. Now, that time has been cut to just less than a year, helping to keep the badge topics and content fresher than ever. Sounds the like BSA has stepped up their game a bit, don’t you agree? What do you think about all these new merit badges in such a short time period? My only quibble about inventing is that it will dilute the ten scouts who have the original merit badge (most likely all long passed on by now). I found out at our district dinner on Friday that the original badge required the earner to get a patent on their invention. I don’t think it will dilute the original merit badge at all. In fact, after looking over the “possible” requirements found at http://www.scoutingnews.org/ it may add a few dozen more to the list. This is definitely not a merit badge the Boy Scouts will be earning at summer camp. I am glad that the boys will not have to get a patent to earn the current badge. I think it would take too long to fulfill that requirement in today’s world.